So Hubby spilled the beans about our little bean and you all now know baby is going to be a boy. Hubby has high hopes about him being all boy and from the ultrasound pics I think it is safe to say we are on the right track. Not a shy little thing in the least. I wonder if this means I will be running around after a son who refuses to wear a diaper? I look at it and can just see our little wrinkly faced baby boy in it. It's sort of perfect that he is being born in the winter, isn't it? Even though my kids are just about grown, I still love all the teeny tiny baby things. Your little boy will be the best-dressed guy in the neighborhood! Awww, how sweet! Congrats on your little boy, very exciting!!! Those are so precious! 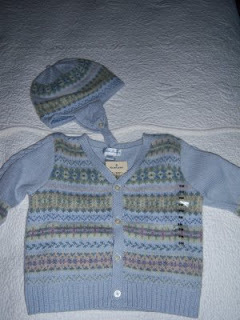 It's so fun to buy clothes for babies, even though they hardly get to wear them because they grow so fast! Oh my gosh, I saw the CUTEST TINIEST little boy in Walmart last night. Yay for little boys! Don't you just love the little clothes??? And yes, you will be running around after a little one who refuses to wear diapers. and eventually, a little one who refuses to wear teeny tiny underpants. mine will try to run around in just his socks for nearly 20 minutes before bathtime! even if it's cold! That little sweater is too adorable for words! Had to check your blog out, I kept seeing it mentioned by SITSas today. Love it. I'm most definitely be back. i love love love ur background...i have 4 girls...what's it like buying those sweet boy clothes? OOOOO tooo sweeeet!!! Check out Strausburg....they have some cute boy things for Holidays. Awww. 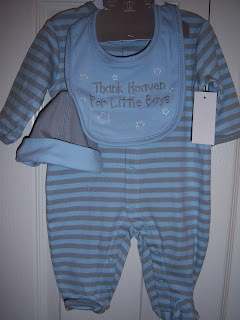 . . such sweet baby boy clothes! So glad I stumbled upon your blog - its nice to read another first Mom-to-Be's experiences! I heart baby clothes! To be honest I had already bought a baby blue scrapbook and a few other things before you guys gave me the call!!! LOL I'm so excited.